A motor car is one of the most expensive items that you will own. It makes sense (and is cheaper in the long run) to keep your car in top condition. 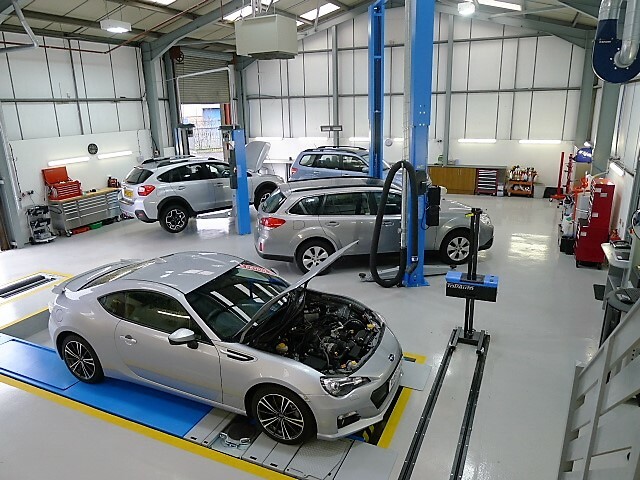 We have some of the best equipped workshops in the area, where your car is treated with the care and respect that an expensive piece of complex engineering deserves. Our philosophy of ‘clean is best’ ensures that the work on your car is not only of the highest standard (this is why Formula 1 teams and the Sky Cycling Teams adopt this approach), but also that your car is looked after in our care. If you choose to leave your car with us whilst your service or repair is completed, we will be pleased to give you a lift to work or home, or why not take one of our high quality courtesy cars. If you choose to wait for your car, our customer lounge offers free refreshments and you can view the work being done from the viewing window in the customer lounge. As a Subaru dealer, our technicians are trained to factory standards, so are familiar with all of the technology used on modern cars. How many local workshops can say that their Technicians are regularly trained, let alone to manufacturer standard?